In our classroom we use play dough with new accessories all of the time. We use cookie cutters, pine cones, leaves, feathers, random parts to broken toys and sometimes just nothing at all. 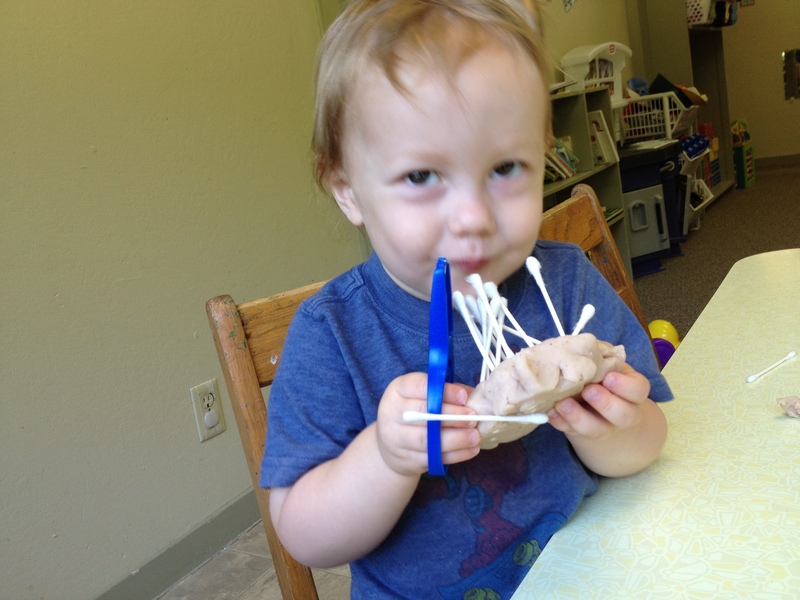 Last week I was at a loss for what to do with a bunch of spirited two year olds and opened my cabinet to find some q-tips. We also use these in many ways, for painting, in shaving cream, to mix paint etc. For whatever reason it had never occurred to me to put these two together before. What followed was pure magic. The magic of toddlers completely engrossed in their work. Working independently with out looking for guidance from an adult. 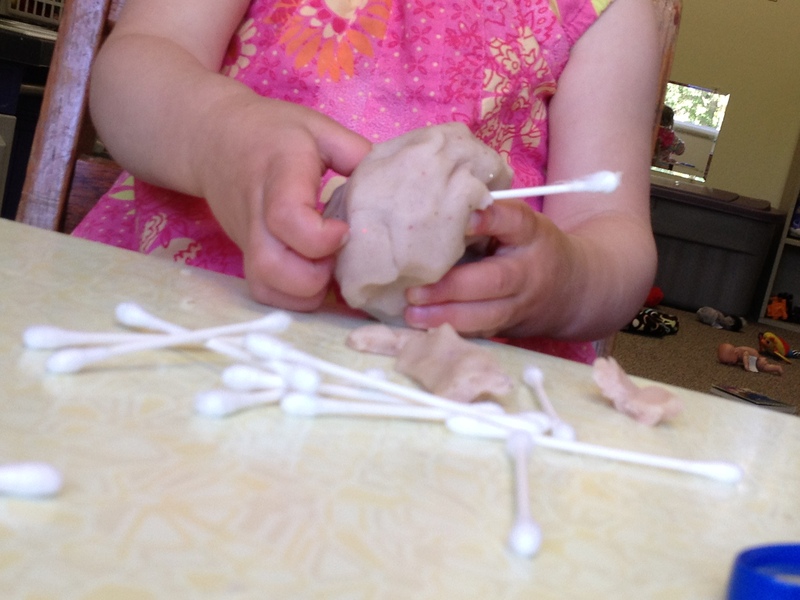 They worked with play dough, q-tips and their ‘training’ scissors for almost thirty-five minutes. I urge to you give it a try if you haven’t already! Tiny fingers grasp the q-tip with delicate precision. 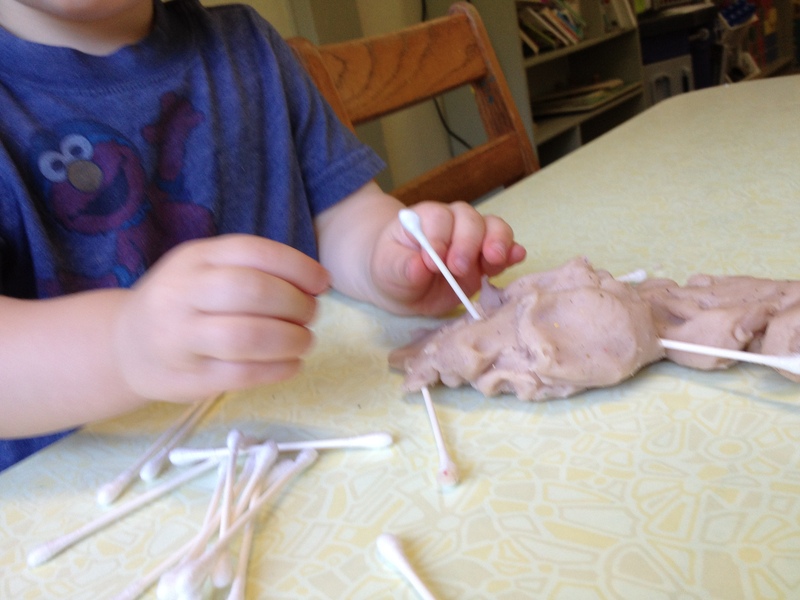 Many discoveries came about organically like how to pull objects through the other side or how long the play dough will dangle on a q-tip before it falls off. Porcupines, cakes and umbrellas all around!! 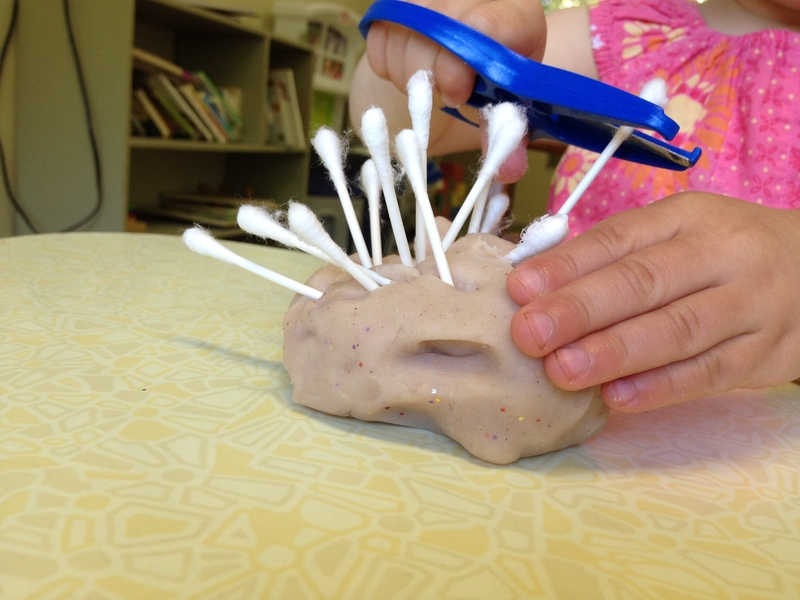 We tried all sorts of ways to insert and remove the q-tips including using the scissors as “tongs”. They were lined up and counted. A beautifully productive, child-led morning of play, learning and exploration. Hope you all had a great weekend. Here’s to another week of supporting the play and honoring the feelings of the littles in our lives! Good Sunday night to you all! 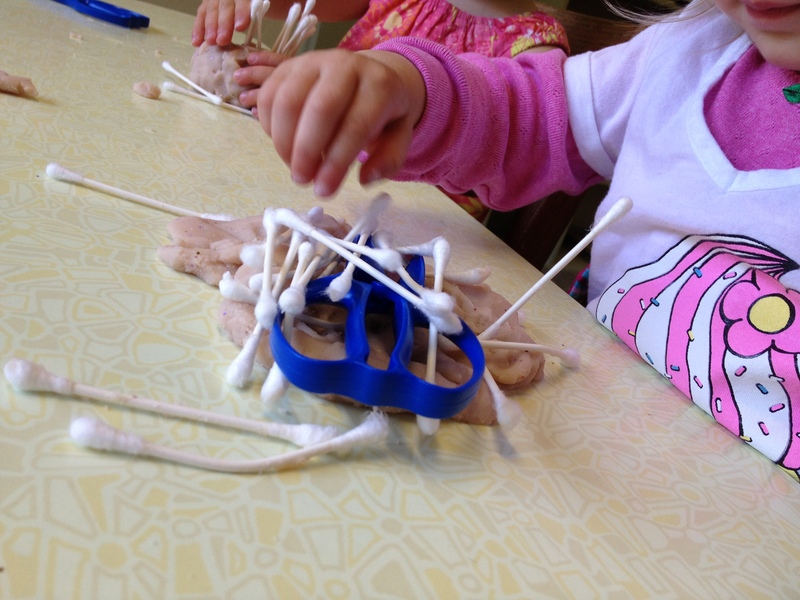 The entire process was full of rich and messy sensory experiences for all (teachers included!) From the feel of paint on paper to the slippery feeling of soapy water on the floor. What? Just wash my feet? Nah…I think I’ll just plop right in this ‘tiny tub’! 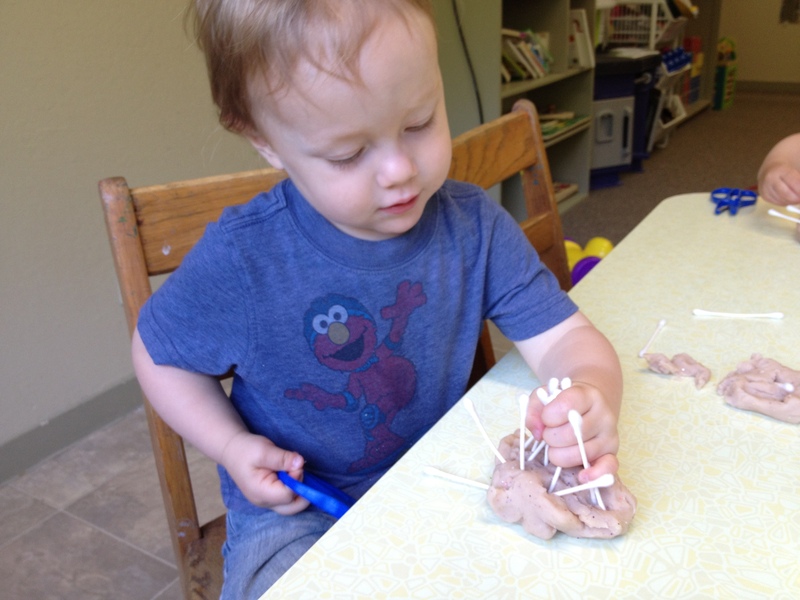 There is much to be gained from gentle, fun, physical play between toddlers and preschoolers. My current group loves to hug, cuddle and walk holding hands. Even though this looks like a ‘take-down’ it was actually a silly, sweet exploration of friends shirtless bodies. They were all besides themselves with laughter to see bellybuttons, backs and tummies. On Sundays I would like to regularly showcase photos, recipies, articles of interest or other tidbits I have come accross this week that I think you would like to see. Other than a short introduction this will be a wordless blog entry. Although I would love, as always, to hear your words in the comments below. This is a photo gallery of two of our fall projects thus far. They both evolved with Collin as a full participant. The first, lights cut in the top of a box, literally got ‘flipped on its side’ when Collin got involved. The second was our annual pumpkin carving which is now more fun, more messy and much less intricate than it was in our years before him. Enjoy!